Plaid Cymru said it would put the nation's health at the core of its 2021 Welsh Assembly election campaign. It is also promising a Clean Air Act to deal with pollution, including that from traffic and the burning of damp wood in household stoves. 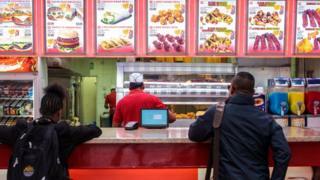 In January, Health Minister Vaughan Gething told AMs "it is not at all clear - in fact, the majority view is that we don't have the powers" to impose planning rules that would stop fast food outlets opening near schools and leisure centres. He said the Welsh Government had "argued" with the UK government about it. But, speaking from the conference in Bangor, Ms Jones told BBC Wales that Plaid Cymru disagreed. "We believe that the assembly has powers over planning, and local government has clearly got responsibility around licensing," she said. "Of course our health minister is a great one for looking for reasons not to do things." Plaid Cymru had been advised that it could be done, she said, but if the party took power it would get "some strong clear views" first, and demand the powers from Westminster if necessary. A Welsh Government spokesperson said: "We launched our Healthy Weight: Healthy Wales consultation in January, which outlines actions to help people maintain a healthy weight. "This includes creating healthy environments to support people to make healthier food choices." Ms Jones also said Plaid wanted a Scottish-style social care system which was free at the point of need and funded through taxation. Asked if there would be tax rises to pay for it, she said: "We wouldn't rule that out. We need to do the sums. "I believe that is something people would be prepared to pay as an alternative to our older citizens losing their homes and their investments and life savings in order to pay for their own care, which we all know isn't fair." Any proposals would be "clearly costed" before going into the manifesto, Ms Jones added. Plaid Cymru is currently in opposition in the assembly, with 10 AMs, and has four MPs. Opening the final afternoon session of the two-day conference, the party's leader in Westminster, Liz Saville Roberts, focused much of her speech on the prisons and the justice system, including the lack of female jails in Wales. The probation service, she said, had "put profit before public safety" when it was partially privatised by UK ministers in 2014. An overhaul of probation, announced last year, means Wales will have no privately-run services when contracts end next year. Image caption Liz Saville Roberts: "We must be masters of our own ship"
Referring to the impasse over Brexit in the House of Commons, Ms Saville Roberts told Plaid Cymru activists "now is our time" because "the government cannot govern and the Labour Party will not oppose". "What were the songs the Brexiteers sang but the siren songs of a false dream? And the rocks are nearby and the time to awake is now. "We must be masters of our own ship," she said, a reference to Plaid Cymru's ultimate goal of Welsh independence. The Dwyfor Meirionnydd MP warmly praised a Europe she said had offered Wales the "practical reality of a helping hand", "enriched our communities" and "enriched our opportunities to work, to live, to love". Plaid Cymru is campaigning for another referendum on leaving the EU. Ex-party leader Dafydd Wigley told the BBC a Brexit compromise was attainable across the House of Commons. "The roadblock to that at present is the leadership of the Conservative Party, who are relying on one formula, and the leadership of the Labour Party, who are just not going to engage, and I believe that it's got to be taken out of their hands," he said. "It's got to be a leadership across parties to get a sensible settlement that looks after our industries, our business, our farmers, our tourism industry, our health dimension. "All these depend on getting a sensible result. It can be got and for God's sake, let's get it." Later, another former Plaid leader, Leanne Wood, called for a "Green New Deal" for Wales. "The window of opportunity to save our planet is fast closing upon us," she said. "Wales could - and should - be a pioneer in the movement to develop carbon neutral economies. "We can lead the way to a sustainable future if there is the right political will." On Friday, Adam Price, who took over from Ms Wood last September after a leadership contest, said Wales should hold a referendum on independence if a series of demands on tax and funding were not met after Brexit. Who is the new leader of Plaid Cymru Adam Price?